The anodyne non-event of her opening words that marked the start of her new era: ‘tonight we’re in Islington, North London. Welcome to Question Time,’ she said blandly – an ‘announcement’ that didn’t receive even ‘polite applause’ from the audience, just silence. ‘It’s lovely to be here,’ she then told us, which it probably was (for her) although ‘lovely’ wasn’t something we associated with Question Time or really wanted from the country’s most prestigious political debate show. Then there was her attempt to demonstrate her authority early on, by forcing journalist Melanie Phillips to commit to a politician she endorsed to be an alternative to Theresa May as a Prime Minister who could ‘deliver Brexit.’ This back-fired when Phillips simply shrugged: ‘no, you can’t push me’, at which point Bruce simply moved on. Her predecessors David Dimbleby, Peter Sissons, and Sir Robin Day would not have folded so easily – if at all. 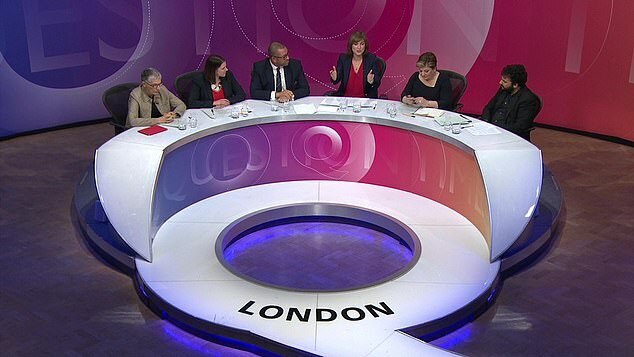 Equally, when Tory MP James Cleverly described a panelist’s opposing view as ‘b******s’, Fiona Bruce said…nothing. She ignored it totally, thereby missing a golden opportunity to show she had the wit and the scorn that the role of presenter on ‘Question Time’ required: shooting the panellists/politicians down when needed (i.e. as often as possible). So to be fair to Fiona, she gamely tried. But she always looked like someone playing the part of a Question Time presenter – not the real thing. Bruce’s cardinal sin was not bringing in the audience enough and allowing the politicians to waffle away, enjoying the sound of their own voices. When she did point to ‘the woman in the yellow jacket’, the lady concerned gave such a thorough, devastating, answer to Bruce’s question why she herself had no truck with the popular view that ‘we should feel sorry for Theresa May’ you felt she would make a better presenter of Question Time than Bruce. After all, for large parts of her career Fiona Bruce had essentially been a newsreader and was still most famous as the face for a Sunday evening programme that couldn’t be more tame. Then again, perhaps Fiona Bruce was perfect. She has really done nothing to revive what has for years now been a lifeless, pointless, exercise in political PR and public prejudices. And her performance on her first episode confirmed that when it came to dynamic, relevant, television, Question Time was basically an antique.